A note about the sausage. I used pre-cooked chicken and jalapeño sausages. If you use these, just dice them up into same sized chunks as the potatoes. If you use raw sausage (a Mexican fresh chorizo would be great in this recipe), just remove the casings and cook it like you would ground beef. Cook the potatoes and cut them into half inch chunks. These could be baked, boiled or even microwaved. For mine, I cut them first and baked about a half hour at 350°F. Also dice the onion and jalapeño. Sear the scallops in oil on both sides, only about 3 minutes total! Cook them on very high heat to get a nice sear. Remove from heat and set aside. In the same oil, add the onion and jalapeño. Be sure to scrape the bottom of the pan to get the browned scallop bits incorporated with the onions and peppers. Cook until just slightly browned, about 7 minutes. Add the cooked sausage to the pan and allow it to brown a bit. Add the potatoes. Add a small amount of water and scrape the bottom of the pan. Add the cumin and chipotle. Cut each scallop into 8 pieces, being sure to leave some of the seared goodness on each piece. Shut off the heat in the pan and stir in the scallops. 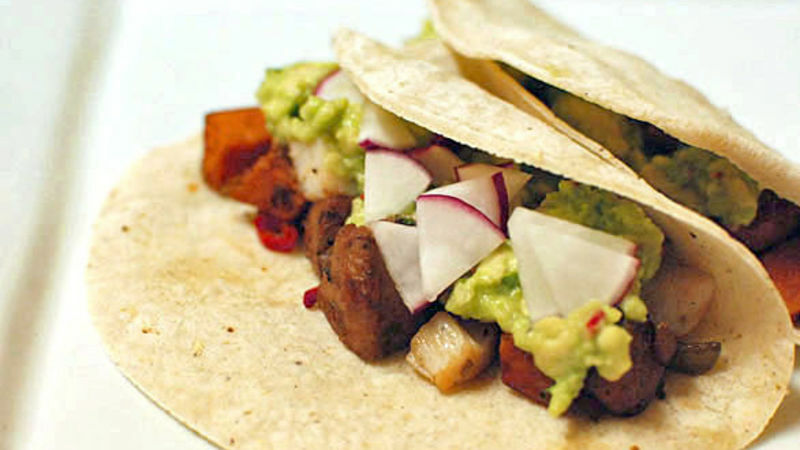 Serve with some warmed up corn tortillas, a nice limey guacamole, and some chopped up radishes. Tacos are one of the best food items ever invented, so why do most people limit themselves to the standard American ground beef yellow crunchy shell variety? Don't get me wrong, I LOVE those kind of tacos, but I also have loved every new type I have tried. In Mexico, tacos of this type are called tacos a la plancha, meaning they are cooked on a flat grill. Most of us don't have a flat grill at home, so a nice big skillet works fine. For this recipe, I used pre-cooked chicken-jalapeno sausages. I was able to just dice this up and add it in the recipe. If you use fresh sausage, just remove it from the casing and brown it, as you would ground beef. A nice fresh Mexican chorizo would work well in this recipe. After the scallops have cooked and are out of the pan, in go the onions and jalapenos. Then the sausage and some already-cooked sweet potatoes. To finish it off, the scallops go back in when the pan is off the heat. Served with some extra limey guacamole and sliced radishes. Smokey, sweet, spicy. Varied texture from the chewy sausage, creamy potatoes, and tender scallops. Make these on taco night this week! Dan Whalen uses guacamole as moisturizer. Check out his blog at The Food in my Beard; check Dan's Tablespoon profile often to try his recipes with creative international spins!